There’s a lot of fuss about the new T-Mobile ad. It’s themed around the Queen’s Diamond Jubilee celebrations and what Britain loves. A stream of characters come out onto the famous balcony at Buckingham Palace including jockeys, a choir, a charity parachutist, and a very camp ‘queen’. The negative comments are mainly that it’s a bit trashy and I suspect because it doesn’t show Britain as people think it should be. Perhaps this is due to a nostalgia for Britain at the time of the Queen’s coronation with red double-decker buses, bowler hats, red letter boxes, the crown jewels, Beefeaters and fish and chips. Indeed those symbols sum up the UK for many people outside Britain. But I like the T-Mobile ad as it celebrates Britain and British people today in all our quirky, haphazardness and often slightly tacky enthusiasms and how we like to send ourselves up. For me it shows how much we embrace the new and absorb it into our culture, for better or for worse. Nowhere is this more evident than in our food and it’s well documented that ‘British curry’ (actually brought to the UK by Bangladeshis) has eclipsed fish and chips as our most popular take-away. I would add ‘Britain loves spicy’ to the list. 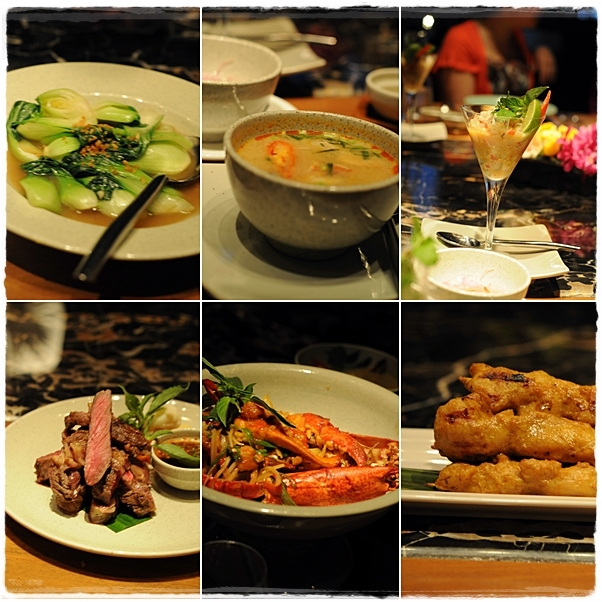 Some of the dishes served at the Mango Tree, Dubai. Bak choi, Tom Yum Goog (spicy soup with prawns), Yum Talay Ceviche, Nua Yang Nam Tok (char-grilled rib eye beef with rocket and chilli salad), Goong Monkorn Prik Pow (stir-fried lobster with chilli paste sauce), Chicken Satay. Invited to the Mango Tree (for a ‘meet and tweet’!) the other evening, I met British chef Paul Kennedy who has taken to a Thai style of cooking with gusto, spending months in Bangkok and shaping a modern Thai menu which has evolved over the past year – getting a bit spicier too (no bad thing). We were treated to a range of dishes from the menu for tasting (and tweeting) while the top of the Dubai Mall fountains shot up past the windows. Favourites for me were yum talay cerviche (marinated mixed seafood salad with spicy lime dressing), gaeng kiew wan goong (prawns with aubergine and sweet basil in a Thai green curry sauce) and khoa niew ma muang (fresh mango served with sweet sticky rice topped with coconut milk). Paul said he was going on Studio One TV to do a special dish for the Jubilee; Thai-inspired Coronation chicken. Now there’s an idea! I must point out that this isn’t Paul’s recipe but one I made up at home and very nice it was too. He was kind enough to give us all a jar of freshly made green curry sauce (which was significantly nicer than my usual curry-in-a-hurry). So whether you are draping yourself in a red, white and blue flag this weekend and having a street party or firmly anti-monarchist (or somewhere in between), I hope this passes muster. Put the chicken, lemongrass stalks, ginger, onion, salt and peppercorns in a pan and cover with water until the thighs are covered. Bring to the boil, partially cover the pan and simmer for an hour until the chicken is cooked. 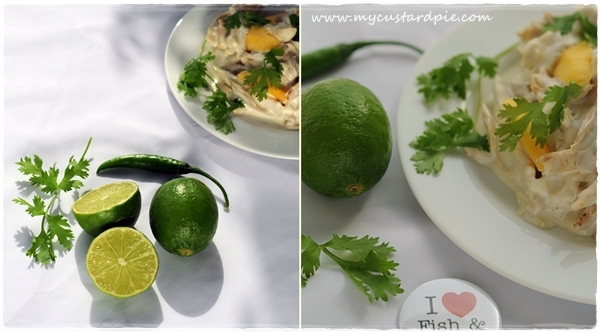 If you can’t get lemongrass or kaffir lime leaves, use the rind of a couple of limes with all white pith removed. Take the chicken out of the stock and allow to cool slightly. Strain the stock and reserve the liquid. 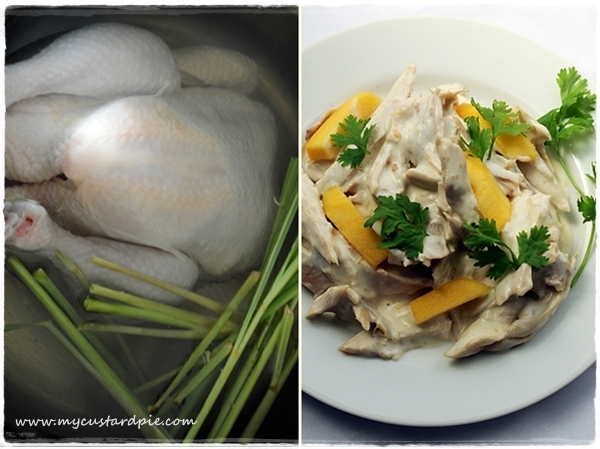 Remove the skin from the chicken and take all the meat off the bones, tearing the flesh into strips. Discard the bones. Refrigerate the stock. You can do this part in advance. Scrape the fat from the top of the stock. Heat the oil in a small frying pan and lightly toast the green curry paste (add more if you like spicy food), add 200 ml of stock and simmer for about 5 minutes. Remove from heat. 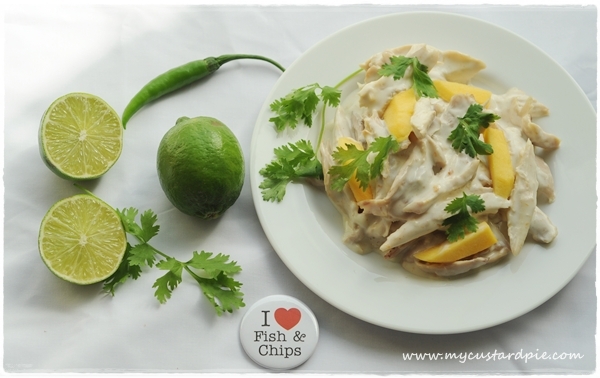 Lightly whisk together the mayonnaise, yoghurt, curried stock, mango chutney and lime juice. Taste and add more lime juice to taste. 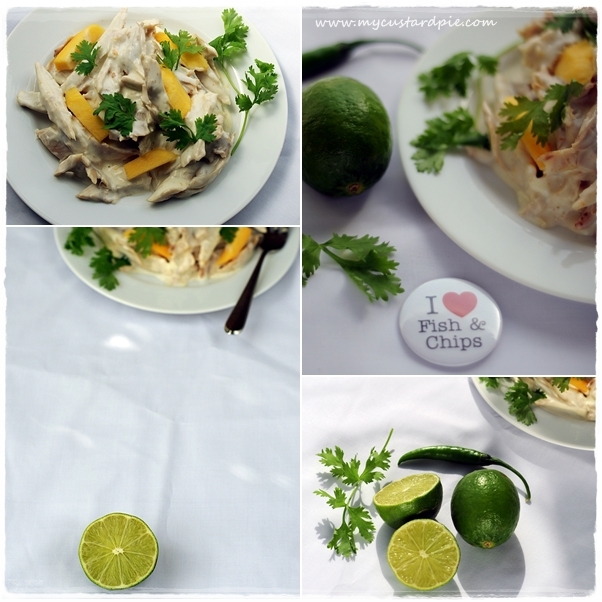 Use coconut cream instead of the mayonnaise for a different taste. 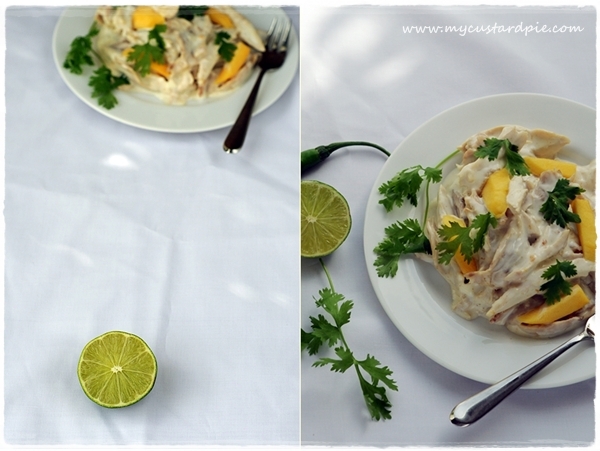 Mix with the chicken and mango and scatter with coriander leaves. Serve with rice or as part of a salad. Put on your socks with sandals, get out your deck chair and Union Jack bunting and make a large pot of tea (optional). So what do you cook for a celebration?Are you celebrating the Jubilee? What sums up Britain to you? Love or hate the T-Mobile ad? I appreciate your comments. My favourite kind of post, Sally – telling a story in order to tell the recipe. So beautifully, wittily done. Another thing we love – which is just as well – is celebrating in the rain. The Jubilee Weekend is turning out to have what you might call classically eccentric British weather. Lucky we love brollies too. Have a great prolonged weekend. Lovely reading. Actually was waiting for an English post published in Dubai… My girls wore the flag colours to school while friends are pestering me to do a funny post on my British friend who speaks in Bengali as he’s married a Bong plus a confused thing that I served to them with English Chai… all in the name of Jubilee celebration!!! Wow-lovely informative post as always Sally-really enjoyed reading it!! Loving the twist on some of my favorite flavors here. People live with their cliches and are disappointed when something new comes along to show them otherwise. Britain for is double-decker busses, Beefeaters and fish and chips but mostly it’s abut the people I have come to know who have shown me so much more to Britain – it’s a melting pot of so many colors, flavors, sights and scenes. 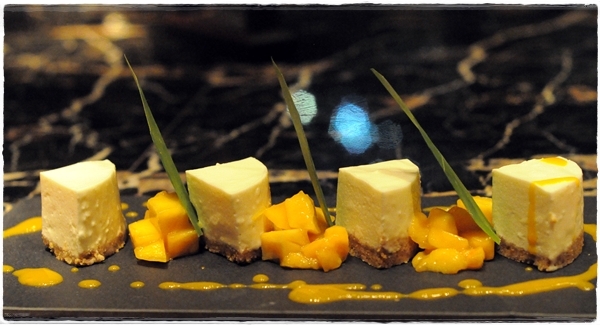 I love all yor posts, Sally, but that mango cheesecake just blew me away! What a beautiful dinner. Your pictures are amazing. I just found your blog and I love it here. Your pictures are beautiful. I can’t wait to read more 🙂 Thank you for the recipe! This looks delicious. 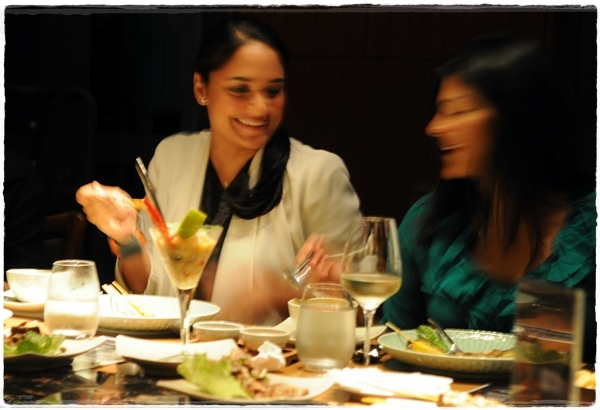 I love Thai inspired food, and your photography is truly beautiful, Sally. Especially got a kick out of the shot of the whole chicken and lemongrass in a pot. ha! Happy celebrating! Haven’t seen the T-Mobile ad, but whatever… Love Britain. Oh wow. This looks great. Thanks for sharing. That dish looks stunning- I have never eaten a chicken coronation before, let alone one with a Thai twist!. And so does the mango cheesecake! BTW that badge is fabulous! That’s a very innovative taste on the classic!